Are you a college student looking for a rewarding summer internship in Agriculture? 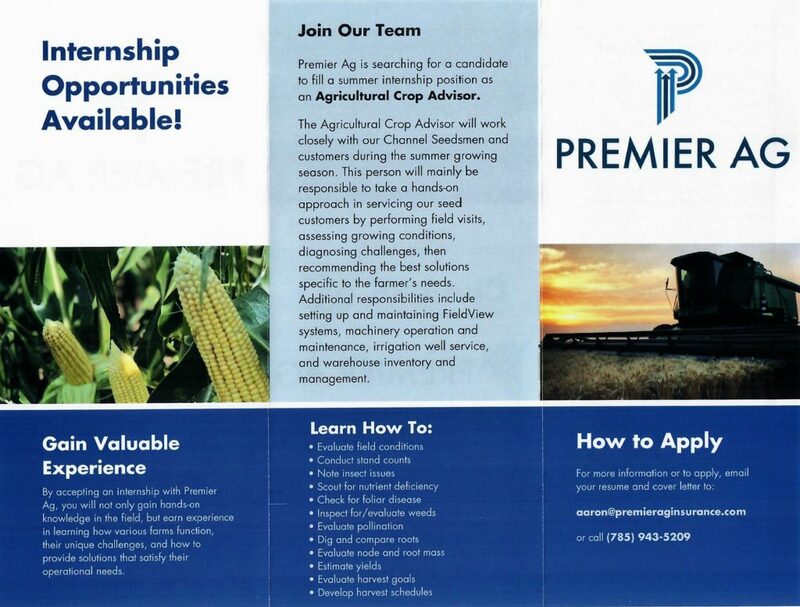 Premier Ag is searching for a candidate to fill a 2019 summer internship position as an Agricultural Crop Advisor. The Agricultural Crop Advisor will work closely with our Channel Seedsmen and customers during the summer growing season. This person will mainly be responsible to take a hands-on approach in servicing our seed customers by performing field visits, assessing growing conditions, diagnosing challenges, then recommending the best solutions specific to the farmer’s needs. Additional responsibilities include setting up and maintaining FieldView systems, machinery operation and maintenance, irrigation well service, and warehouse inventory and management. For more information, give us a call at 785-943-5209 or email info@premieraginsurance.com. Mark your calendar for Premier Ag’s Customer Appreciation and Channel Field Day on Monday, August 27th!